One of the new features that the Galaxy S6's TouchWiz version is going to introduce is called... Themes! And while the concept of 'theming' is known perfectly well within the Android community, we have to say that Samsung's new implementation of the feature looks quite promising. 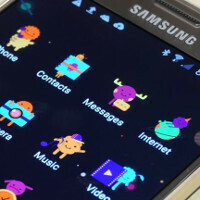 The thing is that while we're used to being able to change our Android devices' home screens, lock screens, and app launchers, Samsung's TouchWiz Themes offer some additional flexibility, seeing how they actually go deeper and customize things, such as icons, fonts, and even core OS applications like the dialer, messaging, or the calendar. Yep, that's how powerful TouchWiz's new themes are going to be. Having this in mind, it's even more exciting to know that TouchWiz Themes, as found on the upcoming Galaxy S6 and Galaxy S6 edge, are will be open to development from third parties, so pretty much everyone with the desire and knowledge to build themes will be able to do so. At the current time, there are just a few options to choose from in the Theme store, but hopefully, the catalog will grow quickly as the new smartphones hit the market and their popularity starts growing. Meanwhile, why don't you check out the images in the following gallery to get a quick look at a couple of themes that are already available for the Galaxy S6! Let us know what you think about this new TouchWiz feature in the comments below the post! I want a material design theme, but black/dark grey instead of white. i wonder if third party developers can create themes? Also, the white text on black background may be a further battery life extender. It gets curiouser and curiouser. Yeah, third-party developers should be able to produce themes. if there's a will there's a way. should i pick up the device, i'll certainly be making a theme or 2. i loved theming on some previous S devices (S2, S3, S4) so it'll be nice to get back to that. Material design theme would be awesome! Yes the white is so ugly. Plus it completely destroys the fact taht we have gorgeous AMOLED screens that can take advantage of high contrast. 100% agree... and it's needed for Super AMOLED. Pink one in Ugly. I like the default one. There will be tons of other themes to download for the Galaxy Apps. How dare you insult one of Samsung's themes. You are probably just an apple fanboy in disguise. LOL!!! Every single phone I have owned till date is off Samsung. My first and last Samsung phone was the Galaxy Nexus. It got really old really fast. Sorry then. I just can't stand those fanboys. It was probably for a female of younger age... to try to attract the new smartphone owners waway from getting the iphone. just a possibility though. Common Samsung instead of those corny looking themes, what about a vanilla Lollipop one!? common samsung which allows devs to make themes as well. look at the lg g3 default themes its just like this. Now i see no reason to root my phones anymore. I can pimp my phone without flashing any mods anymore. I'd like to replace the Touchwiz dailer with the stock Android dailer; the notification shade with the stock Android notification shade; and the settings menu with the stock Android settings menu. In fact if they offered a Google Play edition it would be an instant buy for me. Not as cartoony as that iOS crap. Nope, these icons look like they were drawn by my 5 year old daughter. She must have a Saturday job at Samsung. I think stock Android looks much nicer/classier. If there were to ever start releasing Google Play editions this would be an instant purchase for me.